We would like to invite you to a concert of the Czech Technical University Academic Orchestra at Trinity College Chapel in Cambridge, UK. The concert is held under the auspices of Denise Waddingham, Director of the British Council in the Czech Republic, Mr. Libor Sečka, Ambassador of the Czech Republic to the UK and Guy Roberts of the Prague Shakespeare Company. The CTU Academic Orchestra is a unique musical body in the Czech Republic which gives the opportunity to students from the CTU and other universities to express their musical talents in friendly and noncompetitive setting. The orchestra is conducted by an experienced musician and professional conductor Jan Šrámek. The orchestra performs regularly in the Bethlehem Chapel in Prague and also brings its multi genre repertoire to other domestic and foreign concert halls and stages. To bring the most exciting performance, the orchestra often collaborates with renowned professional musicians. 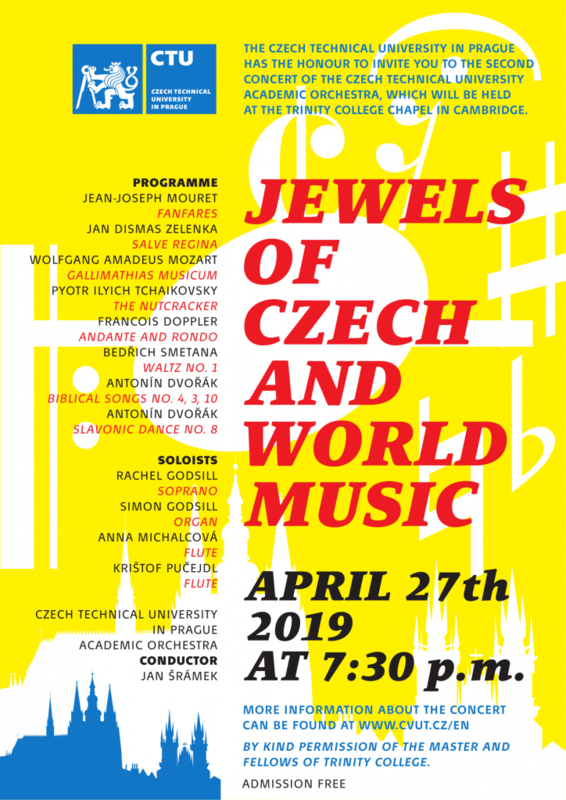 In 2013 the orchestra visited The University of Cambridge, UK, with its ‘Jewels of Czech music’; a varied selection of pieces from famous Czech composers. After a 2016’s joint concert with Collegium Musicum―a visiting student orchestra from RWTH, Aachen―taking place in Prague, The CTU Orchestra was invited to perform in Aachen in 2017, marking another successful international appearance. Two domestic concerts stand out in 2018, including the famous New World Symphony by Antonin Dvorak, and W. A. Mozart’s Requiem. The orchestra is currently rehearsing for upcoming concert hosted, for the second time, by The University of Cambridge in April 2019. The event has been taken under the auspices of Mrs. Denise Waddingham, the Director of British Council Czech Republic, Mr. Libor Sečka, the Ambassador of the Czech Republic in the UK, and Mr. Guy Roberts from the Prague Shakespeare Company.